In the course of a military action in Gaza in July 2014, Israel’s armed forces killed, among others, members of the German-Palestinian Kilani family – a father, mother and their five children aged 4 to 12 years old. Israeli legal authorities so far have refused to investigate the case of the Kilani family. ECCHR together with its partner organization the Palestinian Centre for Human Rights (PCHR) filed a criminal complaint with the German Federal Public Prosecutor (Generalbundesanwalt – GBA) on behalf of Ramsis Kilani from Germany, who lost his father and half-siblings in the strike. The submission provided evidence including photos, videos and witness statements. German citizen Ibrahim Kilani, his wife Taghreed and their five children had fled to the center of Gaza City after leaflets were dropped informing them of planned Israeli airstrikes in their home area of Beit Lahia in the Gaza strip. In summer 2014, Beit Lahia was one of the targets of the military operation "Protective Edge," an operation between 8 July and 26 August 2014 during which Israeli armed forces conducted air strikes in the Gaza strip. In the course of these strikes, civilian facilities and houses were destroyed and heavily damaged and hundreds of civilians were killed. Germany has an obligation to prosecute crimes against German citizens like Ibrahim Kilani – even where those crimes are committed abroad. The primary goal of submitting the criminal complaint is to ensure an adequate legal response to the air strike and initiate investigations. To date the GBA has only set up a monitoring process in the Kilani case. There are however sufficient factual indications that a war crime has been committed, and as such the GBA is obliged to open a formal investigation.The investigations should be followed by the issuing of international arrest warrants. ECCHR and its partners aim to ensure that the law is applied equally to all, irrespective of the position and background of the perpetrators and to strengthen the protective role of law in armed conflicts. At the same time as the complaint was filed in Germany, PCHR also filed a criminal complaint in Israel. Later, they submitted an appeal against the military prosecutor’s decision not to investigate the Kilani case. Two years on, this appeal has still not been processed. The most important questions and answers about the Kilani case. What is the Kilani case about? 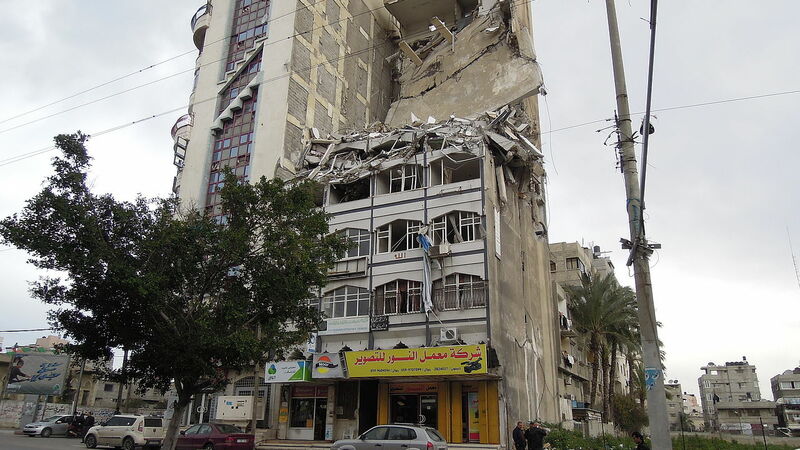 On 21 July 2014, an Israeli rocket hit the Al-Salam tower, a high-rise building in Gaza City and killed, among others, German citizen Ibrahim Kilani, his wife Taghreed and their five children aged four to twelve years. Ibrahim Kilani was an architect who lived with his family in Beit Lahia in the Gaza strip. In summer 2014, Beit Lahia was one of the targets of the military operation "Protective Edge," an operation during which Israeli armed forces conducted air strikes in the Gaza strip between 8 July and 26 August 2014. In the course of these strikes, civilian facilities and houses were destroyed and heavily damaged and hundreds of civilians were killed. At the beginning of the military operation, leaflets were dropped warning of planned Israeli airstrikes in the region of Beit Lahia, asking the local population to leave for their own safety. The family fled to the Al-Shejaia neighbourhood in the Eastern Gaza strip. Due to continued bombing, the family had to flee again – this time to Gaza City. There they stayed in a high-rise building – the Al-Salam tower – in the part of Al-Sabra that was described as safe in the Israeli leaflets. Two days after that, on 21 July 2014, rockets hit the building. Israel stated that the actual target of the attack was a commander of the Palestinian Islamic Jihad. What role does ECCHR play in the Kilani case? In December 2014, the European Center for Constitutional and Human Rights (ECCHR) together with its partner organization the Palestinian Centre for Human Rights (PCHR) filed a criminal complaint with the German Federal Public Prosecutor on behalf of Ramsis Kilani from Germany, who lost his father and half-siblings in the strike. The submission provided evidence including photos, videos and witness statements. At the same time, PCHR filed a criminal complaint in Israel and submitted an appeal against the military prosecutor's decision not to investigate the Kilani case. What does ECCHR hope to achieve by submitting the criminal complaint? The primary goal of submitting the criminal complaint is to ensure an adequate legal response to the deaths of the Kilani family and initiate investigations into the persons responsible for the crimes. With this approach, ECCHR aims to ensure that the law is applied equally to all, irrespective of the position and background of the perpetrators. Further, ECCHR wants to strengthen the role of law in armed conflicts. The investigations by the Office of the Federal Public Prosecutor (Generalbundesanwalt – GBA) should be followed by the issuing of international arrest warrants. ECCHR is representing Ramsis Kilani's interests in the criminal investigations into the killing of his family. Impunity for these kinds of crimes upholds the system in which the perpetrators operate and also represents a grave injustice for survivors and relatives of the victims. Survivors and relatives are forced not only to live with the impact of the crimes but additionally with the lack of consequences and inaction on the part of the international community. Action by the prosecutor in the Kilani case would send a message that these kinds of crimes, no matter where they are committed, will not go unpunished – that they will have legal consequences. What options does the international criminal justice system offer to address human rights violations in the Israel-Gaza conflict? The adoption of the Rome Statute and establishment of the International Criminal Court (ICC) in 2002 made it possible to prosecute certain cases of war crimes, crimes against humanity, and – since 2018 – crimes of aggression in The Hague. Palestine became a state party to the Rome Statute and the ICC in 2015. Since then, the ICC has been conducting a preliminary examination of the situation in the Israeli-occupied territories in Palestine. In May 2018, Palestine presented the situation in Gaza to the ICC. Formal investigations have not yet been initiated but in July 2018 the ICC established a program of "Outreach to Palestinian Victims and Affected Communities." The aim of this outreach is to make available information for victims and affected communities in the situation in Palestine. What avenues are offered by the German legal system to achieve justice for human rights violations in the Israel-Gaza conflict? Germany can prosecute any crime committed abroad if one of the perpetrators or victims is a German citizen, as in the case of Ibrahim Kilani. To date the GBA has only set up a monitoring process in the Kilani case. There are however sufficient factual indications that a war crime has been committed, and as such the GBA is obliged to open a formal investigation. In Germany the Code of Crimes against International Law (Völkerstrafgesetzbuch), which came into force in 2002, allows for the prosecution of crimes against international law committed abroad. This Code brought German criminal law in line with international criminal law. The Code sets out the principle of universal jurisdiction, a principle that allows Germany to prosecute what are known as core international crimes irrespective of where they were committed and irrespective of the nationality of the victims or perpetrators. Prosecutions in Germany would not be an obstacle to future investigations into the overall situation by the Prosecutor at the International Criminal Court. However that Court would be precluded from convicting a person if he or she had already been tried for the same act in another court (the principle of ne bis in idem). Why is the prosecutor obliged to open investigations in the Gaza case? The GBA's obligation to undertake comprehensive prosecution is based on the principle of legality which is set out in the German Code of Criminal Procedure. This principle requires German prosecution authorities to investigate when there are sufficient indications that a serious crime has been committed. The principle of legality upholds equality before the law: regardless of the position or background of a potential perpetrator, German prosecutors are obliged to undertake comprehensive investigations and – where the evidence is sufficient – to press charges. Germany is also obliged to prosecute crimes committed against German nationals abroad. Based on what is known as the passive personality principle, Germany must investigate in cases of crimes committed abroad if the victim is a German national, as is the case with the Kilani family. The criminal complaint by ECCHR and PCHR – against whom is it directed? The complaint is directed against members of the Israeli armed forces and the Israeli government who bear responsibility for the crimes in question. The names of these individuals are not known at this time. In the German legal system, a criminal complaint is a complaint addressing a crime that occurred; it is not directed against individuals as such. Investigating the liability of suspects is a task for the prosecutors. The criminal complaint submitted by ECCHR and PCHR on behalf of Ramis Kilani, the son of Ibrahim Kilani, concerns the killing of the family members. There are factual indications that the killings qualify as war crimes under the German Code of Crimes against International Law. Where did ECCHR get its information on this case? The criminal complaint is based on investigations undertaken by ECCHR and PCHR – this included interviewing witnesses and assessing photos and videos from directly after the attack. The complaint also relies on publicly available documents and reports, in particular the report of the United Nations Independent Commission of Inquiry on the Gaza conflict from 22 June 2015. The report documents the Kilani case, among others, and includes a critical analysis of how the Israeli legal authorities dealt with allegations of crimes committed during Operation "Protective Edge." Further investigative reports from human rights organizations, many of which include witness testimonies, were also relied on in compiling the complaint. What can be achieved through filing a war crimes criminal complaint in Germany? In cases of prosecutions for crimes committed abroad, a criminal complaint often represents the first step towards investigations. The complaint is designed to draw the attention of the GBA to a particular situation which, according to the complainants, amounts to a serious crime falling under the remit of the prosecutor. In this case, the complaint serves initially to highlight the German link to the Kilani family deaths and to provide the prosecutor with the information currently available about the circumstances of those deaths. In the course of criminal proceedings, the prosecutor can – through international mutual judicial assistance and cooperation with foreign authorities – secure evidence and draw a complete picture of the deaths. For this, the materials presented to the prosecutor by ECCHR and PCHR can be used as a starting point. ECCHR and PCHR can also assist the prosecutor with contacting civil society organizations and accessing further evidence such as interviews with witnesses or relevant photographs taken in Gaza. Which steps must now follow? In order to address the systematic and widespread human rights violations in the occupied Palestinian territories, further legal interventions are needed – against all those parties involved in the conflict. There cannot be any political solution to the conflict without justice for those who have suffered rights violations. A legal response to past human rights crimes is of great importance for those involved. It also has a role in the prevention of crimes in other conflicts and contributes to the establishment and stabilization of a democratic society based on the rule of law after the end of the conflict in the region. The German Federal Public Prosecutor must take seriously its obligation to prosecute and initiate investigations. The prosecutor must also make use of available tools for international mutual legal assistance and work closely with Israeli authorities to gather further evidence on the case. Where can I find more information about the Kilani case? • Report on the Kilani family, web documentation by obliteratedfamilies.com, in English, German and Arabic. The monitoring process is a preliminary investigation undertaken by the German Federal Prosecutor. The Office of the German Federal Public Prosecutor is Germany's highest prosecutory authority. War crimes are serious breaches of international humanitarian law committed in armed conflict.